The Internet and digital media have become conduits and locales where millions of Chinese share information and engage in creative expression and social participation. This book takes a cutting-edge look at the impacts and implications of an increasingly networked China. Eleven chapters cover the terrain of a complex social and political environment, revealing how modern China deals with digital media and issues of censorship, online activism, civic life, and global networks. 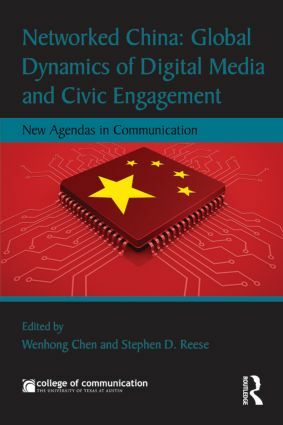 The authors in this collection come from diverse geographical backgrounds and employ methods including ethnography, interview, survey, and digital trace data to reveal the networks that provide the critical components for civic engagement in Chinese society. The Chinese state is a changing, multi-faceted entity, as is the Chinese public that interacts with the new landscape of digital media in adaptive and novel ways. Networked China: Global Dynamics of Digital Media and Civic Engagement situates Chinese internet in its complex, generational context to provide a full and dynamic understanding of contemporary digital media use in China. This volume gives readers new agendas for this study and creates vital new signposts on the way for future research. Wenhong Chen isan assistant professor of media studies at the University of Texas Austin where she studies implications of digital media and communication technologies. Stephen D. Reese is professor of Journalism and Associate Dean for Academic Affairs for the College of Communication at the University of Texas Austin.